Next generation architectures will require intelligence distributed throughout the network infrastructure. The adoption of multi-gigabit networks and planned roll-out of next generation 5G networks will continue to create greater available network bandwidth as more and more computing and storage services get funneled to the cloud. Increasingly, applications running on IoT and mobile devices connected to the network are becoming more intelligent and compute-intensive. However, with so many resources being channeled to the cloud, there is strain on today’s networks. Instead of following a conventional cloud centralized model, next generation architecture will require a much greater proportion of its intelligence to be distributed throughout the network infrastructure. High performance computing hardware (accompanied by the relevant software), will need to be located at the edge of the network. A distributed model of operation should provide the needed compute and security functionality required for edge devices, enable compelling real-time services and overcome inherent latency issues for applications like automotive, virtual reality and industrial computing. With these applications, analytics of high resolution video and audio content is also needed. 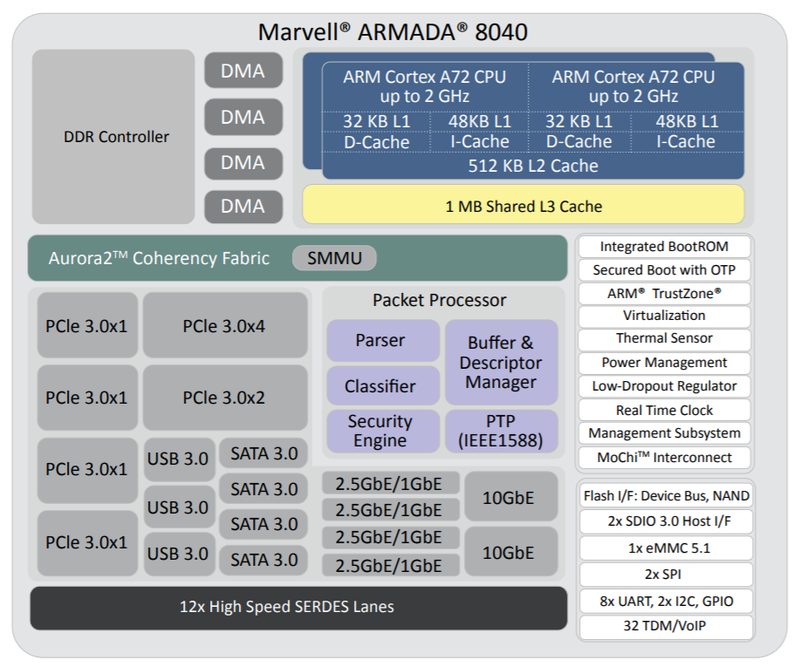 At CES 2018, Marvell and Pixeom teams demonstrated a fully effective, but not costly, edge computing system using the Marvell MACCHIATObin community board using the ARMADA 8040 SoC in conjunction with the Pixeom Edge Platform to extend functionality of Google Cloud Platform services at the edge of the network. The Edge Platform software is able to extend the cloud capabilities by orchestrating and running Docker container-based micro-services on the MACCHIATObin community board. Currently, the transmission of data-heavy, high resolution video content to the cloud for analysis purposes places a lot of strain on network infrastructure, proving to be both resource-intensive and also expensive. Using Marvell’s MACCHIATObin hardware as a basis, Pixeom demonstrated its container-based edge computing solution which provides video analytics capabilities at the network edge. This unique combination of hardware and software provides a highly optimized and straightforward way to enable more processing and storage resources to be situated at the edge of the network. The technology can significantly increase operational efficiency levels and reduce latency. The Marvell and Pixeom demonstration deploys Google TensorFlow micro-services at the network edge to enable a variety of different key functions, including object detection, facial recognition, text reading (for name badges, license plates, etc.) and intelligent notifications (for security/safety alerts). This technology encompasses the full scope of potential applications, covering everything from video surveillance and autonomous vehicles, right through to smart retail and artificial intelligence. Pixeom offers a complete edge computing solution, enabling cloud service providers to package, deploy, and orchestrate containerized applications at scale, running on-premise “Edge IoT Cores.” To accelerate development, Cores come with built-in machine learning, FaaS, data processing, messaging, API management, analytics, offloading capabilities to Google Cloud, and more. The MACCHIATObin community board is using Marvell’s ARMADA 8040 processor and has a 64-bit ARMv8 quad-core processor core (running at up to 2.0GHZ), and supports up to 16GB of DDR4 memory and a wide array of different I/Os. Through use of Linux on the Marvell MACCHIATObin board, the Pixeom Edge IoT platform can facilitate implementation of edge computing servers (or cloudlets) at the periphery of the cloud network. This hardware platform can run advanced machine learning, data processing, and IoT functions. The role-based access features also mean that developers situated in different locations can collaborate with one another in order to create compelling edge computing implementations. Pixeom supplies all the edge computing support needed to allow Marvell embedded processors users to establish their own edge-based applications, thus offloading operations from the center of the network. Marvell’s technology is compatible with the Google Cloud platform, which enables the management and analysis of deployed edge computing resources at scale. Here, the MACCHIATObin board provides the hardware foundation needed by engineers, supplying them with all the processing, memory and connectivity required. Maen Suleiman is a senior software product line manager at Marvell.